Anyone can write. And everyone who wants to write should have access to the wealth of Iowa City’s Writing Culture. The Free Generative Writing Workshop provides a space for career writers, curious beginners, writers of all income levels and stages of life. Our goal is to make it easy to meet and learn from some of the most talented writer/teachers living in or passing through Iowa City. 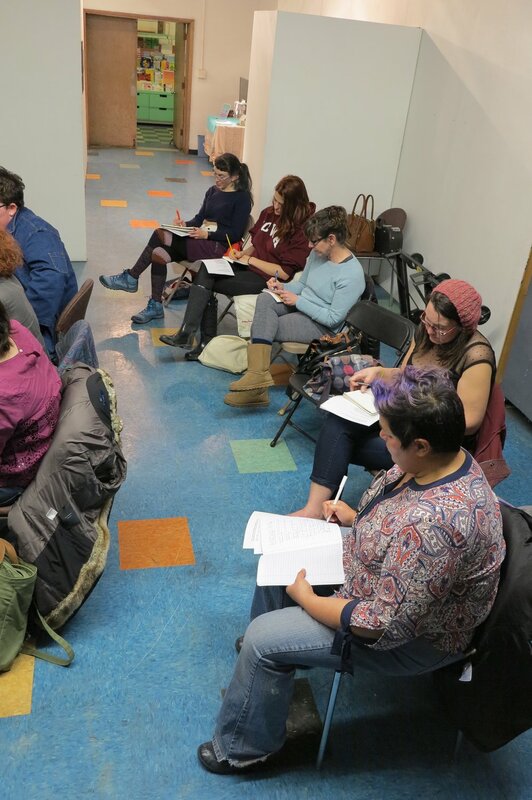 Every month a new writer leads a generative workshop, presenting a prompt inspired by their own preoccupations, passions, or interests. Prompts have run the gamut of writing from Tarot cards, to finding inspiration in the villanelle; from ekphrasis to open letters of resistance to government officials. It has been an adventure, and we are continually inspired by the creative concentration of participants, and the powerful beginnings the workshop generates. As we enter our fifth year, we have created a new space to publish not only some of the prompts of our leaders, but responses to those prompts, written by participants. We hope this publishing platform provides incentive to writers to revise, expand, continue in whatever way their imaginations lead, and then perhaps to send us their pieces and let us share them with the world. Free Generative Writing Workshops meet on the 3rd Sunday of every month, and you’re always invited. Workshops run from 5:30 to 7:00 pm in Public Space One. That’s the community art space downstairs in The Wesley Center at 120 North Dubuque Street in Iowa City. Workshops are always free, and adults writing in all genres at all levels are welcome.